Am I Celebrating Life or Death? On Ash Wednesday, you may have made plans to drop by church to have ashes imposed on your forehead. Ashes to ashes, dust to dust. Remember that you are dust, and to dust you shall return. Are we celebrating death? Isn’t Christianity a religion of life? 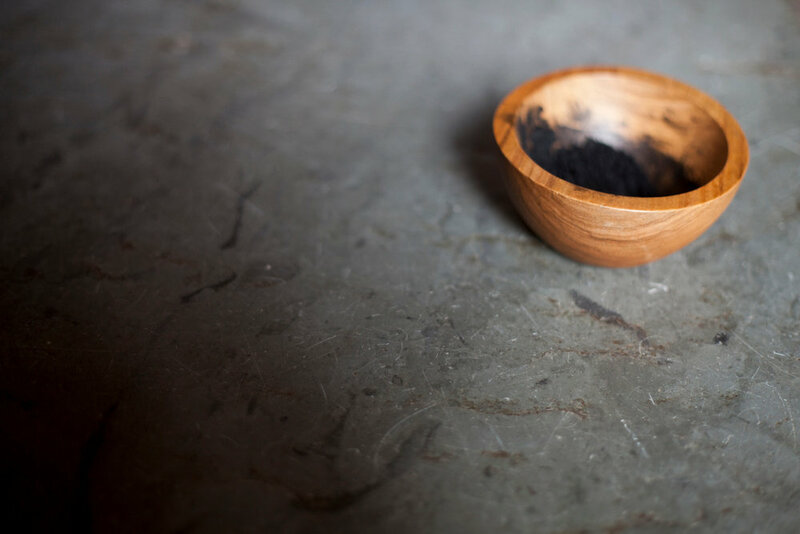 Perhaps Ash Wednesday is a great dialogue between life and death. 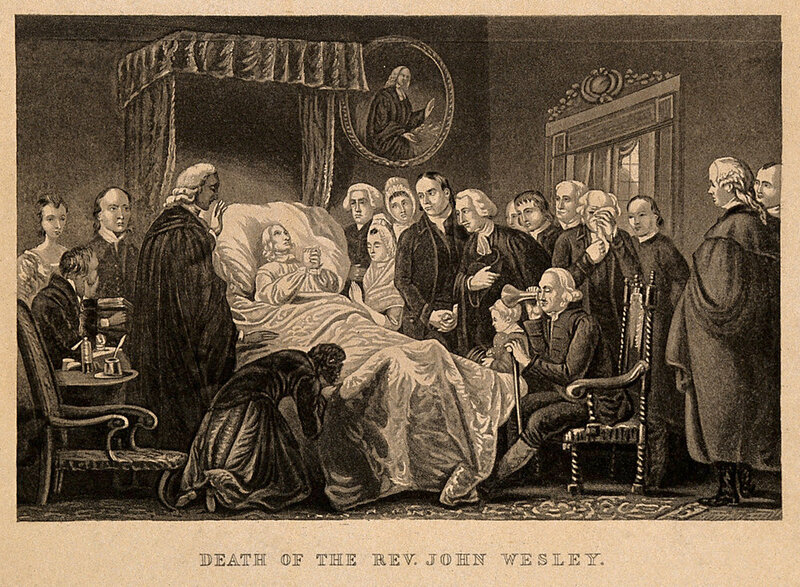 Many years ago a professor of worship died suddenly in her office at a seminary. A note found on her desk read “what if we taught everybody that their baptism was preparation for death?” These were her parting blows. Her last stab at attending to the mystery of faith. Baptism, that symbol of rebirth, the water symbolizing a spiritual birth canal out from which God births us and begins the initial work of mothering. That symbol, is about death? And not in a “fingers crossed that this will stick and I get to go to heaven!” kinda way. But maybe because a good death only happens when we live a good life. Death has been called “the great sleep?” What if this Ash Wednesday (and Lent, the season that Ash Wednesday kicks off) we remembered to sleep? What if we took rest and sabbath and made it real in the world? What if our remembrance of our death led us to living our life in a more human way? Let’s take this lent slow. Let’s sleep. Burned out? Anxious? Want to explore rest with others? Check out this little, tiny, short survey! In 1990 the people of North Lawndale in Chicago saw piles of debris begin to build in their neighborhood. That illegal dump would continue to build for six more years as it became a mountain. At some points 6 stories high, the dump was across the street from a school. The story of that dump and the reasons it existed and persisted, are juicy and exciting. But unfortunately, I won’t get into that here. 4 years later, the mountain still growing in North Lawndale, another illegal dump began to grow in another neighborhood of Chicago. Again, it was across the street from a school. That school, however, was not on the west side of Chicago, as North Lawndale is, but on the north. It was also one of the top prep schools in the city, a highly selective magnet school. If you know much about Chicago, the city is perhaps one of the most segregated in the country. And the west and south sides are mostly Black neighborhoods, and on the North side, mostly White neighborhoods. These two dumps not only were both across the street from schools, they also faced the same kind of push back. In North Lawndale, they “called who’s who to who’s that.” The neighborhood organized, marched, and did all the things a neighborhood movement does to get attention to an issue. They created organizations and night watches to record the trucks that illegally dumped. On the north side of town, the parents at the prep school did all the same things. Within 3 weeks the dump on the north side was gone. The one in North Lawndale continued to grow. Houston, 1970. Just like in Chicago, most dumps in the city of Houston, both legal and illegal, were in Black neighborhoods, like this one in the Sunnyside neighborhood. This story is incredibly depressing in so many ways. But the thing that struck me was the lost possibility. What would have happened in the neighbors on the north side had a sense of solidarity with North Lawndale? What if they insisted that the city clean up all the illegal dumps? What great possibility for solidarity! Instead it would take 2 more years for the dumps in North Lawndale to begin to be cleaned up. Houston also has great possibility. What ways do we face issues in our neighborhood that our neighbors on the other side of town also face? Here in the East End, we face so many of the same struggles that those in the 3rd Ward face. Our struggles are so often the same as those in the 5th Ward. One way we are beginning to work in the East End with other neighbors, is through the Houston Community Land Trust (HCLT). If you have read this blog before, you may be wondering why I keep coming to this. We have a great opportunity to create a beautiful, affordable, sustaining option for housing all around the city. Some have pushed the dream that this could be the largest Community Land Trust in the country! What if we banded together as a city to say yes to these options? What other ways can we lean into each other? If you want to learn more about the story of North Lawndale, check out The City, a podcast. For mobility, it ranks 20 out of 143 for percentage of households without a car. Pride, community, remembrance. These are some of the most important themes of the Dia de los Muertos. With history rooted in indigenous Mexican culture and the Christian All Saints Day, the festival is a perfect way to capture ideas needed in the East End: pride of where you come from, remembrance of the past, and a sense that we all belong to each other and we need each other. I was getting excited for this festival that St. Paul’s and the East End Missional Community is helping with, but then this happened. Leo Tanguma, native sun of the East End and fiery muralist, will be coming from Colorado to be present with us. If you don’t know his work, take a stroll down to the county building at 5900 Canal St. And I do mean stroll, this is not something you can just zoom by in your car to fully appreciate. This year we are anticipating the largest Dia De Los Muertos ever. Want to know more? Last Tuesday I got to see several months of hard work get together. By the end of the night, the team working together had that giddy, tired look of a group of folks that worked hard and pulled off a plan. 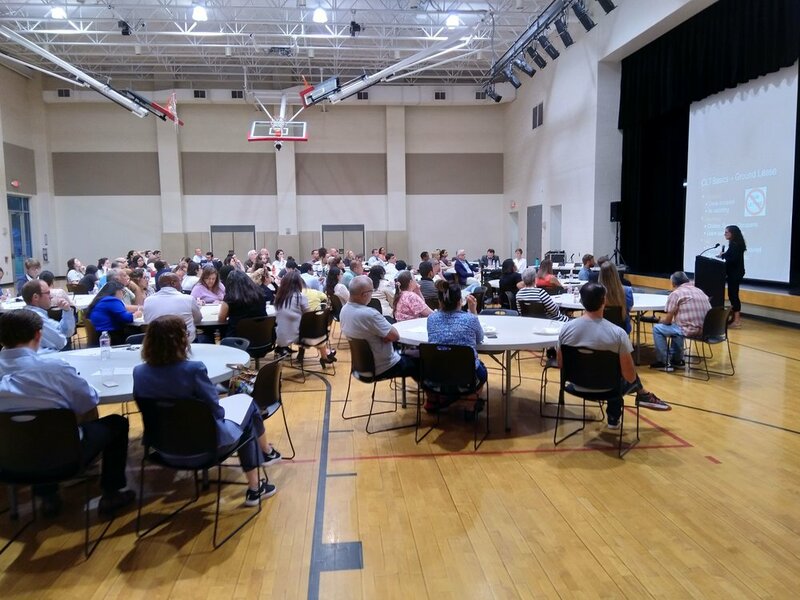 Back in July, we began discussing how the East End could build a Community Land Trust (CLT). A CLT preserves housing affordability and ensures that longtime residents can stay in their community. We met with the City, began to have conversations together, and under the banner of the 2nd Ward Super-neighborhood Council and East End Collaborative, we worked together to have a meeting for our neighborhood about a technical land issue that had right around 100 people! Clearly our success in bringing the neighborhood out has more to do with the dire need to preserve the East End’s historic housing affordability. This conversation has been happening in fits and starts around the East End for many years, now that we are publicly lifting this issue up, our vision is for the East End to really raise up their voices so we can speak to the need for good housing. The important first step is vision. What does housing affordability look like for the East End? How do you balance the need for cost effective housing affordability without including large high rise buildings? Vision only comes when we keep talking as a neighborhood. And frankly, part of me hates that answer. People are ready to talk talk talk, when are they going to be ready to act? But if we know how we need to act so that we can be in solidarity with one another, then we truly can make an impact. So East End, are you ready to raise your voice? Are you ready to plan the steps so we can march in lock step? Check out our survey so we can keep you updated and involved. One of the coolest things about being a pastor is when you get to be a cheerleader for cool things your people do. Last week was basically cheer week for me. On Monday, I got together with an awesome team to plan out the details of our conversation on a Community Land Trust (CLT) in the East End. This is seriously the dream team. Nobody has an ego about it, everybody is pouring themselves into the work, everybody cares deeply about their neighborhood. Come support us! On Tuesday, my neighbor came over and we created signage for our national night out. This neighbor is awesome because he constantly is thinking about ways to care for the neighborhood. 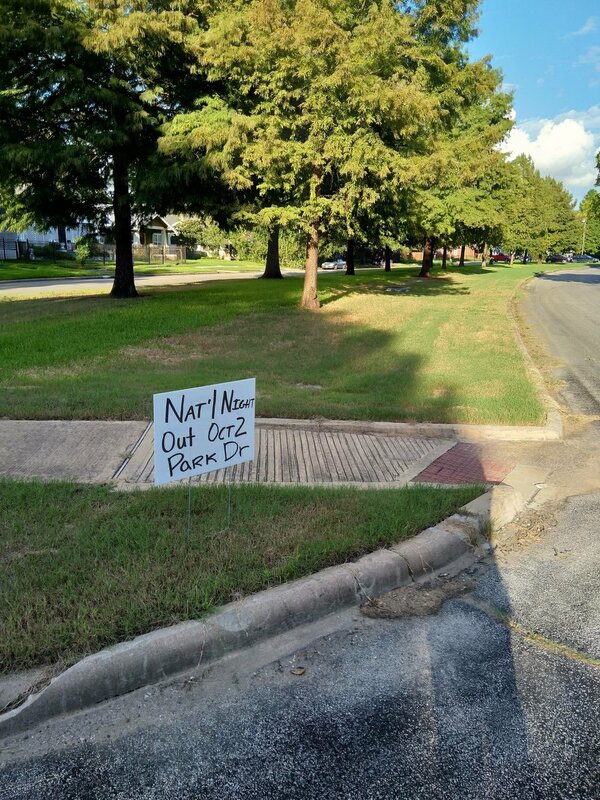 He picked up some of the illegally placed yard signs and re-purposed them for the good of the neighborhood. Running, I darted over to see the good work my friend Priscilla had done to create a voter registration drive. The East End is a neighborhood with historically low voter turnout numbers for a lot of reasons. Distrust of the authorities, gerrymandering making the only real elections the primaries, and the difficulty of figuring out voting if you are working as much as my neighbors work. But Priscilla is changing that and getting the word out about voting! Bob, Tom, and Linda from St. Paul’s showed up to help! Wednesday, I got to cheer as my friend Estella got confirmed to be on TIRZ #23. I only barely knew what the TIRZ’s did when I started now, and if I am being honest, I don’t know the ins and outs. But Estella is going to be a great voice for the community. She will get to advocate for ways that the communities tax dollars get spent and help make sure money set aside for affordable housing gets used in a equitable way. Yay to Estella! Creating affordable housing is a tricky thing, I am learning. It’s expensive for one. But also, NIMBY (not in my backyard) voices drive up the costs. But affordable housing is really important as a key component of a comprehensive plan to resist gentrification. But what a challenging thing happens when you try to build affordable housing in gentrifying neighborhoods. First, let’s talk about gentrification. It’s a term that goes back to London, describing the way that city’s real estate has been used to park global capital and in turn has driven up prices and made the city only livable for the wealthy. All across the US though, there are neighborhoods that are changing and wealthier, typically whiter, residents are moving in. Gentrification, however, is such a loaded term it’s unhelpful. Alternative words used to describe the real underlying affects of gentrification are “displacement” and “erasure.” Displacement describes the that gentrifying neighborhoods are pushing out lower income residents as new ones move in. Erasure can meet lots of things- cultural erasure, erasing the stories of the neighborhood, erasing the history of the people who had traditionally lived in that place. But those two ideas don’t always go together. When new people enter a community, any kind of community, the community will change. This happens at church. With every new member, the nature of the community changes. The effect may be small, but the community inevitably faces stress as soon as new people move in. So, what if we stopped everybody from coming in? What if we discouraged new members at our church? What if we held protests at every new business that wasn’t like us? That is the strategy that a lot of neighborhoods take, and it makes sense. This is the defense against being erased. We are still here! We matter! Hear our stories and our history! Too often that voice can mean the discouragement of new development. Of any kind. With no new development, the new residents keep coming and displacement increases. With it, the unintended consequence of erasure. Can the East End of Houston resist the ugly forces of displacement and erasure? It will take a heart full of hospitality and a rooting in justice. We need to welcome new residents, but also teach the history and stories of the neighborhood. We need to celebrate the culture. We need to show the heroes of the neighborhood. We also have to accept that development will happen, but advocate for what that development looks like. It will take wisdom, a sense of solidarity, maturity, and a strong sense of identity. Remember Christmas in July? Apparently it started at a North Carolina Summer Camp. But it is easy to understand why it caught on, at least for marketers and those of Northern European origin living in the Southern Hemisphere. Christmas makes a lot of money for retailers, and people equate winter with Christmas in the Northern Hemisphere. But part of me wants to take another sacred time and remember it too at an odd part of the year. September is a part of the year that has new beginnings, even if it doesn't get quite the fuss that New Year gets. So it shares something with Spring in that way, another time where new life is surrounding us. That concept of new life is probably a good reason Easter is celebrated in the spring- Easter is the resurrection after all. But we live in a culture of death. We don't always see new life. As I am preparing for a class at St. Paul's, Water, Spirit, Body, Blood, I am thinking a lot about new life. In doing so I am reminded of one of my favorite hymns, No. 307, Christ is Risen. It may not get a lot of air time at your house, but you may recall the tune. It is the same as Infant Holy, Infant Lowly. Yes, that's right, the Christmas Carol. New birth is an important theme of the new song, birth in the midst of death. That is the message of Easter, isn't it? Christ is risen! Earth and Heaven never more shall be the same/Break the bread of new creation where a world is still in pain/ Tell its grim, demonic chorus: "Christ is risen! Get you gone! "/ God the First and Last is with us/Shout Hosanna everyone! There are so many exclamation points in this song! But don't you love that line, "Tell its grim, demonic chorus: "Christ is risen! Get you gone!" I love it because it so boldly stands up to evil present in this world. There is evil present in this world, but Christ defeated evil and we get to shout it down! What day did you become a Christian? If you had contact with certain denominations in the Christian faith, maybe you have been asked this question. A similar one might ring a bell as well- when were you saved? Talking to close friends and colleagues, I know some picked a random day to legitimize their faith to their questioner. Ok, but seriously, when do you officially become a Christian? In the early church, I'm talking like 2,000 years ago, the Roman Empire liked to joke about the latest sect of Judaism. They were cannibals or something, always eating this guys body and blood. Maybe all the baby's they have been adopting are being eaten by these people! Rumors spread about the "Last Supper," "Great Thanksgiving," "Eucharist," or "Communion." But what actually is the point of it? Maybe you were raised Catholic or Orthodox Christian. Why do Methodists and other protestants only have 2 sacraments? What happened to confirmation, marriage, ordination, healing, and confession (reconciliation)? 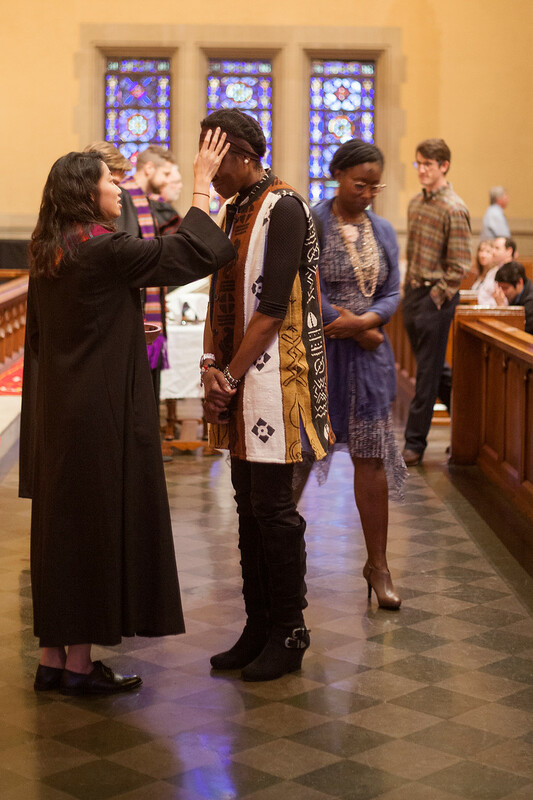 And furthermore, why do we have this delineation between the times I experience God's grace out in the world and these ceremonies inside a church building? If any of these questions sound familiar, if you have ever participated in a sacrament and wondered what was happening, if you have a kid you keeps asking probing questions about church that you are just not sure about, this class is for you. This is going to be an interactive class, with optional reading for between sessions, and sure to have plenty of ah-ha! moments. You know when you can't sleep? I remember my high school calculus teacher mentioned how he read about a book a week on top of teaching school full time, having a small business as a side hustle, and raising two kids. Where did he get the time? Insomnia. I heard about one of the investigators of Watergate used to really bother his wife tossing and turning all night. By the time she ended up asking him what was up, it was the night before the whole world was about hear the recordings of Nixon coordinating the Watergate break in. This whole time he couldn't sleep because he was working on the biggest scandal in US history. Charles’ journal and letters from that journey reveal a disconnect between his hope for the gospel and his emotional experience. Just before landing, he wrote his female friends back in England: “I cannot follow my own advice; but yet I advise you — Give God your hearts” (Feb. 5, 1736)." I always find so much hope when I see that my heroes had as much trouble as me. Maybe that seems counter-intuitive. But just the fact that I am not alone in those midnight moments of the heart helps. But also, that last line quoted from the Wesley Bros. really gets me, "look my Midnight into Day." There is such a strong desire to not be in the midnight time of despair. And it feels like God could just so easily fix everything, with just a glance. However, when we are in the middle of the night, the greatest lie is that we are alone. The lie tells us that even God is not there. Nobody cares, nobody will listen, I have no hope. But the truth of the Gospel tells us that God made every sacrifice to be here in the midst of us. God took on a body as Jesus. Jesus sent the Holy Spirit to stay with us. We are not alone. Perhaps this is why Charles' brother, John, said on his death bed, "best of all, God is with us." P.S. If you are struggling with the midnight of the soul, maybe you need spiritual guidance. If that is the case, I know any pastor would be happy to listen. But don't kid yourself, there are lots of ways that we can be in the midnight time. If you are struggling with depression please reach out to a professional counselor or therapist who can do far more than your pastor. We would be happy to recommend one to you. I used to imagine a world where people desired power. It was a bad thing. My problem was when I imagined people, I imagined individual people who were power hungry. If we are all thirsting for control over one another, we will all be unhappy. Even the people who end up with power. I had a failure of imagination all my life around the idea of power. I could only see a world where some people were on top, and the rest were on the problem. Power, however, can be wielded by the people. Not individual people, but the collective people. All of us together. That kind of power imagines a world where all people can flourish. Where, as Jesuit Gregory Boyle imagines, the circle of compassion is wide enough for everybody to fit in. Where we no longer desire the best future for our own children, but for all the children, for all the people. This week I heard on the radio about a war between these two images of power. Uganda has a president who wields absolute power. A musical artist turned member of parliament has led a popular movement that desires a new way of imagining power. At stake is the future of the East African country. This musical artist goes by the name Bobi Wine. Wine had a successful recording life but moved back into the neighborhood he was from and declared himself the "ghetto president." He desired to be an advocate for his friends and neighbors and won a seat in the Ugandan parliament. He quickly realized that parliament was not going to make a large change. He puts his revelation this way, "I realized that a dictatorship does not fear the Parliament whatsoever, does not fear even any system, does not fear the courts, but it fears the people." The power lies in the people. This lesson has become more relevant as I have lived in a neighborhood where few residents would be considered very powerful. If anything is going to be done, it has to come from the work of the people. But people banding together does not mean that there is a common good. I read this week that there tremendous bipartisan hatred of affordable housing. When people own their own land, they become far less interested in where other people are going to live and far more interested in property values. This NIMBYism (not in my backyard), is particularly distressing considering that we are currently undergoing a housing crisis in Houston, only exasperated by Hurricane Harvey. Put simply, people need good, affordable places to live. And not enough of them exist. This is why I am so excited about the discussions that have been happening in the East End around the Houston Community Land Trust. The city has been working in the 3rd Ward and is engaging conversations with many other neighborhoods as well. This could be an incredible opportunity to provide perpetually affordable housing for vulnerable members of the neighborhood that otherwise would be priced out and displaced. The only thing left to do? Lets make our voices heard for a new kind of power in the world. A world where all people can flourish, all people can have a home in a good community, and the most vulnerable are cared for. Let's say yes to affordable housing, workforce housing, and senior housing! 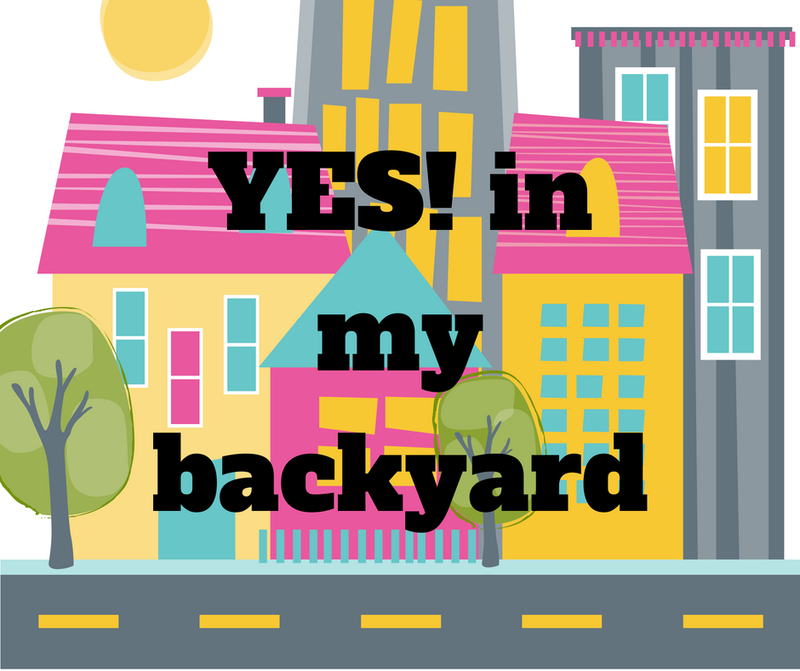 Let's turn the cries of "not in my backyard" to shouts of "YES in my backyard!" For more on the Houston Community Land Trust, and I do mean more, a lot more, check out: this! In the early 19th century in the United States, white European immigrants were taking more and more land west of the Atlantic Coast. There was lots of movement, but people settled down where they were. The people who never settled, never were rooted, was the Methodist preacher. These circuit riders, who traveled from town to town, covering a circuit of small churches and preaching points, helped shape the United States and also made the Methodist movement a pervasive movement across the United States. But us Methodist preachers aren't the only ones whose jobs make them move. We now live in a world where only a very small amount of people will stay put for their entire lives. So we don't know our neighbors. We don't have a community. So what if we had block parties where we knew we could connect with some neighbors every month? That was the first question I began asking my new friends, Christi Vasquez and Michael Martin. Out of that conversation, the Pineview Block Party was formed. A month later, the Eastwood Block Party began. We are now 6 months into hosting small picnic like gatherings of neighbors. And we are only getting started. Our vision for the East End Block Party is to create the framework of belonging in the East End of Houston. We are going to be the structure that really is inclusive in a radical sense. The Block Party is for everybody- regardless of social class, immigration status, race, or creed, the Block Party welcomes everybody in the neighborhood. While the work simple- we are just neighbors creating community through games, food, and art- the effect can be profound. Not only are we creating a place where all are welcome, we are creating a space where two different types of people are meeting- the white new resident who is a part of this movement back to the city by young white professionals, and the Latinx community that has taken root in the East End throughout the last 100 years. Those two groups need to know one another. White people like myself need to know the cares, concerns, and dreams of our neighbors. The Latinx community needs to be supported and known by us new neighbors so there fight against gentrification can be a unified voice desiring affordable housing and maintaining neighborhood culture. In other words, these block parties are a revolution. We are changing the way the neighborhood works, will you join your neighborhood's block party? Starting a new thing is really hard. It will never get going unless you have your people. Perhaps the more profane way to talk about it is to say you need your inspiration, your model, the church or ministry that you absolutely adore and want to just totally copy and steal from. a mural in the South Minneapolis neighborhood that has the much loved monarch butterfly, a symbol of immigration as it annually travels from Canada down to Mexico. 1. They know who they are. The really funny thing is that visitors when I was there were asked how they found New City and what made them come. One really bluntly said that they were looking for a church that cared. That got them. Unsurprisingly, this was a person of color who was in a profession because they saw it as a force for good, and wanted to find a church that got her. Even the visitors understand in some innate way what New City is about. Beyond that, the leadership can spit out the core beliefs and the vision. It's ingrained. 2. They live out who they are. New City is engaged in all manner of environmental justice work. They do they kind of work that is all about people, and they don't pretend that environmental justice is about middle class white people. They bring fruit trees to anybody who wants them. They teach gardening to their neighbors. They advocate at systemic levels for a more just city. They do the work as a church. 3. They are innovative and daring in a secular world that doesn't know they need God. Everybody is part time at New City. The pastor teaches zumba and picks up other work here and there to pay the bills. Everybody has a day job. They chose the most multi-racial and politically radical neighborhood to set up shop. They are constantly improving, constantly pushing forward, and constantly working together and collaborating even as challenging as it is to work with a staff that only sees one another a couple times a week. New City is doing some cool things, but the Gospel takes root different ways in different places. So what on earth is God doing in Houston? In the East End? God is up to something in the East End of Houston. It's mysterious and confusing. In other words, its the work of God. Come, let us join God's work in the world and dare to dream of what could be. One of my favorite things about Bible Study is that you get people around a table discussing big things. Sometimes a Bible Study can become abstract, and that's ok too, but often times we get to have a space to ask the big questions like "how do I spend my money?" "what does it mean to be a good member of my community?" and "what does it mean to be saved by God?" Frankly, whenever I get a group of people together working on a common goal, a little bit of magic can happen. You remember that feeling. You were a part of a team where everybody was bought in. You left the space really excited about what could be. You were energized. This week begins a new part of work in the East End. For nearly a year now, I have been getting to know the neighborhood and my neighbors. In the last few months, I have been discussing the question "what could be" with some of the neighborhood leaders. Now, using the platform of an organization called the East End Collaborative, we are going to do some grasstops organizing. That is, as civic and nonprofit leaders, we are going to dream and ask the big questions together about the neighborhood. We are going to challenge each other and question the status quo. We are going to dream of a neighborhood that works for everybody, not just the wealthy and middle class. Hopefully, that collaboration will be magic. My work in the East End has seemed to hover over one idea: gentrification. And it's about people. In East Austin, gentrification has displaced the African American and Latinx communities. Notice the changing housing stock. The smartest people on the subject of gentrification have fleshed out the term with two more terms: displacement and erasure. Displacement describes the ways in which gentrification forces rent to increase. With rising rent comes people looking to more and more creative places to be able to live. Many choose to live elsewhere. In places like the East End of Houston, most people are renters. The East End is a place to find cheap housing, especially for lots of immigrants from Mexico and other countries in Central America. One person has even told me that in some places in Mexico the neighborhood of Magnolia Park in the East End is quite well known as an important landing spot of new arrivals to the US. This means the neighborhood is an important place of culture and identity formation. Leaving the neighborhood is not a simple move. In the well regarded book by Robert Putnam, Bowling Alone, Putnam argues that people are becoming less civically engaged and therefore losing social capital. Missed in this analysis are the economic forces of displacement that cause the loss of social capital. For people who have been displaced from their homes, they no longer have neighbors to look after their kids. They no longer have the same friendships that they have cultivated over years in their neighborhood. Often they don't have the same social network to help them find jobs. When I was in High School, I learned about how the economy worked. They taught us that the market dictates things like jobs. We also learned about the history of jobs and how certain industries have failed causing massive job loss. The lesson I learned was cruel: the market changes and certain industries change or fail, so sometimes workers get left out. But that's capitalism. So too with people who are displaced. We live in a global economy, so people need to go to where jobs are and if it's too expensive, they move somewhere else. This is the way the world works, and it leaves people without their people. What are your thoughts? Comment! St. Paul's United Methodist Church has one of the great choirs in the city. I know this because I hear all the time from people who travel far and wide to be a part of a great choir. And they've landed at St. Paul's. There is a certain professionalism too- our choir takes itself quite seriously and performs at a high level. This has often led some members of the gathered body of Christ on a Sunday morning to look rather bewildered as they compare themselves to the pros. Perhaps one of the funniest sights in my last year in worship at St. Paul's was a worshiper looking down at her hymnal. Clearly trying to read the music, or at the very minimum, the words, the worshiper merely shook her head as she attempted to follow along. It really typified the the challenge when you sing the United Methodist Hymnal. To paraphrase my father, an incredible singer, "sometimes you just get some odd 19th century song in there that nobody can sing!" For me, then, the question becomes, who should be allowed to sing? The answer, if we put on the mind of Christ, should be everybody. Even if your singing voice by itself causes despair to those who hear you sing in the shower. Even if you identify as tone deaf. Even if you physically cannot sing. You can sing. In the US, we are so focused on talent. Exceptionalism. We want to be the best at something. We want to stand out. We love celebrity and we celebrate talent. Missed in our belief in expertise is that music, like sports, is for everybody. One of the most heartfelt expressions of this was the wheelchair soccer league that happened at a church I previously worked at. This league featured two people working together as one, one bound to a wheelchair, often specialized wheelchairs for somebody with cerebral palsy, for example. The large three foot diameter ball was more beach ball than soccer ball, but two teams competed every Saturday. Was this competitive? no. Was it sports? undeniably. Singing together is also a sacred task. It binds us together, lifts our minds to another time, place, and space, and changes our disposition and orientation. Singing together in a sacred space, however, has an even greater effect. The favorite phrase among Catholics, if you sing your prayers, you pray twice certainly applies. But even greater than that. singing together spiritual songs is an experience of fellowship, community, and dare I say it, heaven. There is a foretaste of God's heavenly banquet in our singing together. So let's sing together, even if we don't think we can. When I was studying abroad in Germany in 2010-11, I got a chance to go to Rome between semesters. There certainly are many things to do and see in Rome, and certainly the Vatican was at the top. I spent a whole day slowly walking through both St. Peter's Basilica and the Vatican Museum. The most amazing thing about the Vatican is how much people are rushing ahead to see the famous things. At one point there was a literal crossroads- go right to see the Sistine Chapel, you know, the famous one painted by the non-pizza-eating, non-teenage-mutant-ninja-turtle Michelangelo. To the left however, just more paintings. I stood at that crossroads, going through what appeared to me to be a pretty standard gallery of pretty cool art. Until I came to it: perhaps the second most famous piece of art in the Vatican, The School of Athens by (also the non-pizza-eating, non-teenage-mutant-ninja-turtle) Raphael. I of course saw the Sistine Chapel, which I am not going to put in a little image box next to this paragraph, because if you can't mentally imagine it at this point, I don't know that you deserve to see it here. However, the thing that I will always remember is seeing a little marker next to John Paul I's tomb deep in the crypt of St. Peter's Basillica, "The Smiling Pope." Well, never to be outdone, I now officially, publicly declare my intentions to be remembered thusly: Pastor Paul Richards-Kuan, "the Laughing Pastor." Fr. Gregory Boyle, noted LA priest who founded Homeboy Industries, once gave an interview with Krista Tippet on her show "On Being." She began by asking him why he does what he does, his opening stuck with me, "I was educated by Jesuits, so I — for me, they were always sort of this combo burger of absolute hilarity and joy and the most fun people to be around. And they were prophetic. So, this was during the time of the Vietnam War. So we'd laugh a lot, and I'd go with them to protesting the war. So the combination of the prophetic and the hilarious — I loved that. So I thought, boy, I'll have what they're having, you know? So that's what I did. It's not very deep, but that's kind of — the reasons you join an organization like the Society of Jesus aren't the reasons you stay. But that kind of was my initial hook." A combo burger of absolute hilarity and joy. What whimsical language. And yet, I might have to contest what Fr. Boyle said a little bit- is it shallow to see absolute joy and be attracted to it? Another Jesuit, Fr. James Martin, wrote the book on faith and humor, Between Heaven and Mirth. There he writes, "Joy, humor, and laughter show one's faith in God. For Christians, an essentially hopeful outlook shows people that you believe in the Resurrection, in the power of life over death, and in the power of love over hatred. Don't you think that after the Resurrection Jesus's disciples were joyful? 'All will be well, and all will be well, and all manner of things will be well,' as the fourteenth-century mystic Blessed Julian of Norwich said. For believers in general, humor shows your trust in God, who will ultimately make all things well. Joy reveals faith." One person who is constantly joking and laughing is somebody I work with- Bill Kerley. Bill is best known by the Houston Chronicle as one of the most dedicated submitters of terrible one line jokes. For Christmas he decided to really spread the laughter by giving us all solar-powered dancing Jesus figurines. I personally stuck mine on my car dash. Now, every time I get in I am reminded of a goofy dancing version of Jesus. People comment, "look at that Jesus go," or "Dance Jesus Dance!" but they also sometimes start following along the dance of Jesus, his hips swinging with the power of the sun. Now that Easter has come, now that we celebrate the joy of the Resurrection, are you dancing? Are you laughing and singing with joy? Do you live the kind of life that insists that you are full of joy? Well if not, maybe you will be inspired by a dancing, wiggly, Jesus. Why is there rioting? Why are we fighting so much? Whats going on in our country? Some of the same questions we were asking 50 years ago we continue to ask today. Is it so clear that we are better off? 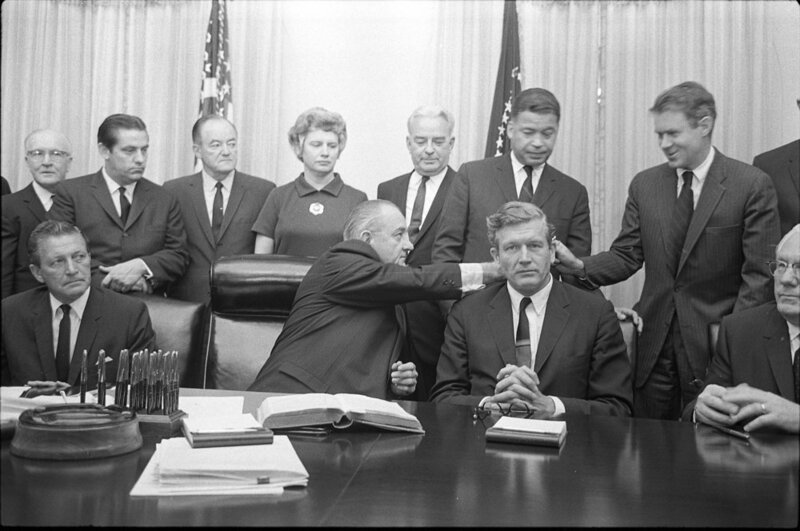 President Lyndon Baines Johnson with some members of the National Advisory Commission on Civil Disorders (Kerner Commission) in the Cabinet Room of the White House, Washington, D.C.
A month before the death of MLK, the Kerner Report was released (If you want a refresher, read this beautiful illustrated story here). It sought to answer the above questions. It also gave some pretty difficult prescriptions to our society. I am struck by what I see as my own response when I am told to do something by a doctor. At my best, I react like my grandfather who upon suffering a heart attack took up a strict diet, began hiking and exercising rigorously, and totally changed his health outlook. At my worst, I become paralyzed by the daunting fear of trying to do so much with such little time. What I deeply hope I never become is the one who ignores or denounces the doctor's prescription. Sadly, this is exactly what we did with the Kerner Report. So I think today, April 4th, 2018, the best way to heed the legacy of Martin Luther King is to follow the spirit of the recommendations of the Kerner Report. We need investment in our Black, Brown, and Native communities. We need more affordable housing. We need better paying jobs. We need greater investments in our schools. We need healthcare that works for all people. Are we ready to listen to the doctor's prescription and swallow the hard pill to take?